The first Gyu-Kaku Japanese BBQ Restaurant opened in 1996 in Japan. After four years, Gyu-Kaku Japanese BBQ grew over 200 outlets in Japan alone, signifying the love for Japanese BBQ taking the country by storm. Soon, Gyu-Kaku went international to US, Taiwan, Singapore, Hong Kong, Thailand and it finally reached our Malaysian shores in 2012 at One Utama Shopping Centre. Today Gyu-Kaku has three outlets to cater to its many Japanese yakiniku fans. A few of us gathered at its first outlet in One Utama recently to get a taste of the smokeless Japanese BBQ. The outlet is located in Isetan’s food paradise together with other restaurants. Conceptually designed with an open concept, the many booths and open space allows every passerby to be tempted with all the senses of the Japanese BBQ. Designed with Japanese theme using lots of wood furniture, wooden wall panels, wooden raised platform flooring and box lightings, Gyu-Kaku is set to remind everyone of its roots. The menu pretty much focuses on beef, all cuts of the cow that is perfect for grilling. Besides the highlight of the beef cuts, there are some other appetizers, salads, rice and noodle with some desserts. One can make your selection of beef ala carte or simply opt for their set meals filled with various cuts of meat and seafood paired with salad, soup, rice and dessert. Gyu-Kaku is famous for their smokeless BBQ, using special smokeless charcoal that creates a steady strong heat but doesn’t emit the usual smokiness. The restaurant also has a strong down-draft ventilation system to ensure that the smoke is well controlled. Bibs are also given to protect our clothes or in case one is just a messy eater. Once the orders were logged in, we settle in with our drinks. Gyu-kaku has a good list of beverages, from non-alcoholic to the alcohols that include Japanese sakes. Gyu-Kaku has quite a long list of appetizers to whet one’s appetite. Ours of that evening was Fried Shrimp Gyoza (RM12.90) featuring crispy fried gyoza finished with Okonomiyaki sauce and mayonaise with Bonito flakes. The gyoza has a shrimp filling. This is pretty much delicious as we all polished this off happily. Since we knew we were going to be packing in lots of meat, we were glad that Gyu-Kaku has also a decent list of salads and greens to offer. We had a Horenzo Salad (RM8.90) and Assorted Namuru Salad (RM14.90). The Assorted Namuru reminds of Banchan. It is basically an assortment of seasoned or marinated white radish, spinach, bean sprout and black fungus. Expect lots of textures and flavours with these vegetables and they all go very well with grilled meat and seafood. When our platter of various beef cuts arrives, I was pretty impressed! At sight, the beef quality really stands out. You know you are getting the freshest and premium cuts of the beef by looking at how beautiful the meats were. Gyu-Kaku’s beef cuts available are Karubi (short rib or oyster blade), Rump Cap (round primal cut), Harami (tender and low fat content), Fillet (undercut of sirloin), Brisket (prime cuts that include superficial & deep pectorals), Beef Tongue (delicious & subtle), Shabu Shabu Grill (thinly sliced beef strips) and Tsubo Zuke Karubi (marinated short rib with homemade Shabu dressing). Prices start from RM14.90 to RM35.90. If one is feeling rather indulgence, then go for Gyu-Kaku’s Wagyu cuts from Wagyu Brisket, Wagyu Rump Cap, Wagyu Karubi and Wagyu Tenderloin. These are priced from RM26.90 to RM99.00. All meats come with choice of marination of Rock Salt (Himalaya), Tare, Shio, Miso, Spicy Miso and Miso/Shio with Leeks. We got busy. All the meats really only require a very quick grill on the coals since I prefer my meat to be medium. What I really enjoyed was Karubi, Brisket, Fillet, Shabu Shabu Grill and surprisingly Beef Tongue. I actually concluded that I prefer my meat with a marbling content as these are simply tastier and tenderer. Of course the Karubi was my ultimate favorite with its glorious marbling content, making it unctuously scrumptious. The Beef Tongue is superbly tender, almost melting upon contact with my mouth. I also enjoyed the meat simply seasoned with salt as I can enjoy the natural beefy flavours of the beef cuts. For those who love heavier flavours, one can opt for the miso or spicy miso or simply dip your grilled meats into the sauces provided. Besides the Yakiniku, we also had some of their set meals, rice and noodles as filler. Feast on some of their signature noodles like Gomanegi Ramen (RM16.90) and Tantan Ramen (RM18.90). Comfort ramen noodles soaked in earthy and spicy flavours accompanied by lots of veggies and other condiments. During lunch, there are also set meals like this Chicken Katsu Set (RM18.90) which has a large piece of golden fried panko crumbed chicken served with tonkatsu sauce, rice, soup and a dessert. It’s a complete meal perfect for lunch and the best part is that it comes with a dessert too! If one should have to consume carb, make sure its well worth it just like the Ishiyaki Mentaiko that is available a la carte (RM20.90) and also as a lunch set (RM17.90). Served in a hot stone bowl, the rice has salmon, cod roe or mentaiko, lots of fresh lettuce, seaweed, sesame and butter. Simply mixed all these together and enjoy the sheer simplicity of buttery rice with burst of umami salty cod roe and salmon. The rice is so gorgeous in flavours that we raved over it happily. I would return to Gyu-Kaku simply just for this rice! All good meals had to come to an end and it did end with desserts. Milk Pudding (RM9.90) is a signature of Gyu-Kaku’s and I can see why. The milk pudding reminds me of Panna Cotta and this one is very milky and creamy with a light Japanese brown sugar syrup and soya bean powder. It’s been a while since I had S’mores and I was literally excited when I saw that Gyu-Kaku has a version of S’mores (RM5.90) as a dessert option. Nothing beats the memories of those days in the States during campfires where I would toast marshmallows over fire in the autumn nights and sandwich the oozy melted mallows with graham crackers and chocolate. We did the same with ours over the coals here and these are just so oozy and sinfully yum! 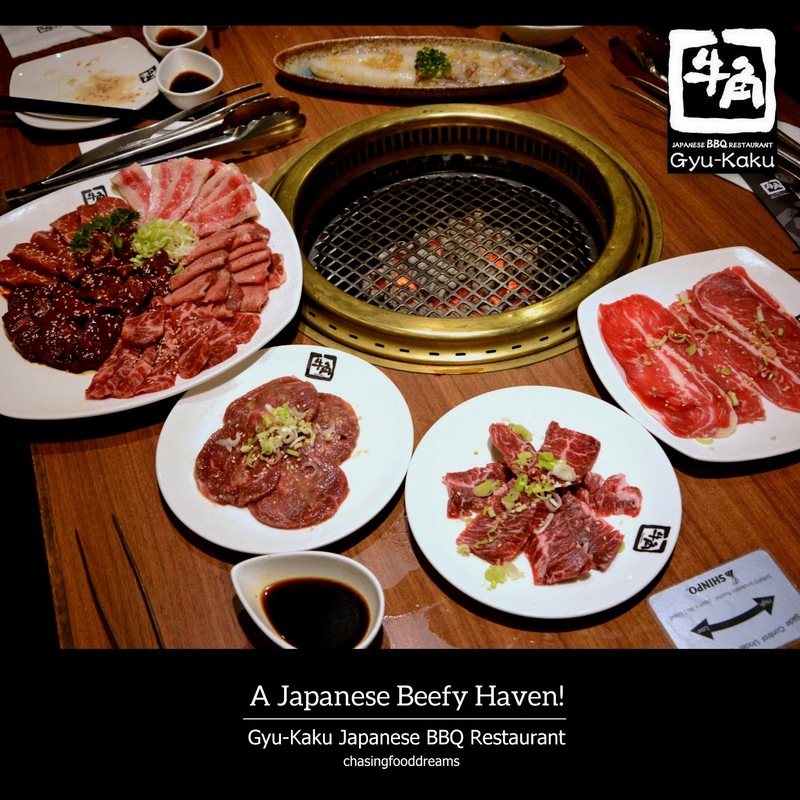 Gyu-Kaku Japanese BBQ Restaurant has a lot to offer for beef lovers! The meat served is definitely prime cuts and quality. In addition, one does not have to deal with all the smoky and mess over a BBQ, so simply head over here whenever your BBQ craving sets in. I planned to return for some beef and most important of all, that awesome Ishiyaki Mentaiko rice! MyDunlopilloMoments … Every Mattress Has A Story!